Now I might sound like a fussy 8 year old – but I hate bananas. And love banana bread. No, I don’t really get it either. Could it be the texture of ‘real’ bananas – bit claggy? Anyway – this is a lovely gooey moist cake – the most frequent kind I make really. I use lots and lots of walnuts because they’re delicious and add a nice bite to this loaf – but other nuts would obviously work fine. It’s a great way to use up bananas. They’re so cheap I often over-purchase for my other half and then I always seem to have leftovers – and I hate waste even more than ‘real’ bananas. So this squidgy loaf will be entered into the No Waste Food Challenge (this month hosted by Elizabeth’s Kitchen Diary) – but you can also enter below too) and Camilla and Helen’s Credit Crunch Munch (this month hosted by Jo’s Kitchen). 1. Heat the oven to 170C and line a loaf tin with greased baking parchment. 2. Mix together the butter, sugar, egg, flour, baking powder and bananas in a large bowl with an electric whisk. 3. Stir in the walnuts and pour the batter into the loaf tin. 4. Bake for about 1 hour or until cooked through in the middle. A fantastic take on a classic – banana loaf is so versatile and moreish. Pass us a slice, will you? 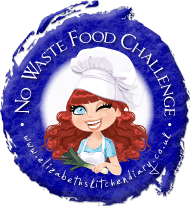 Thank you for sharing with the no waste food challenge! No problem – thanks for hosting! I buy my bananas in bulk from the market and can pick up around 30 for £1. Then I need to do something with them! Your loaf looks super. Thank you for linking up to Credit Crunch Munch. Wow 30 for £1 that’s amazing – where’s that! ?